"Wow, you really love this place, don't you?" The service is wonderful. 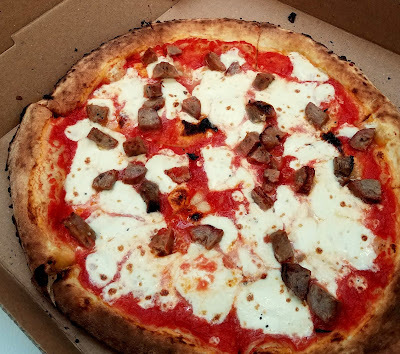 On my second visit, the manager came over and talked to our table about the pizza we'd tried which was new that evening, asking for feedback and telling us about some plans in the works. On my last visit, when I was still waiting for my friends, the hostess came out and offered me a table without my asking. Those are just a couple of examples but the staff just go above and beyond and they seem to do so cheerfully. It's something I notice and appreciate every time. 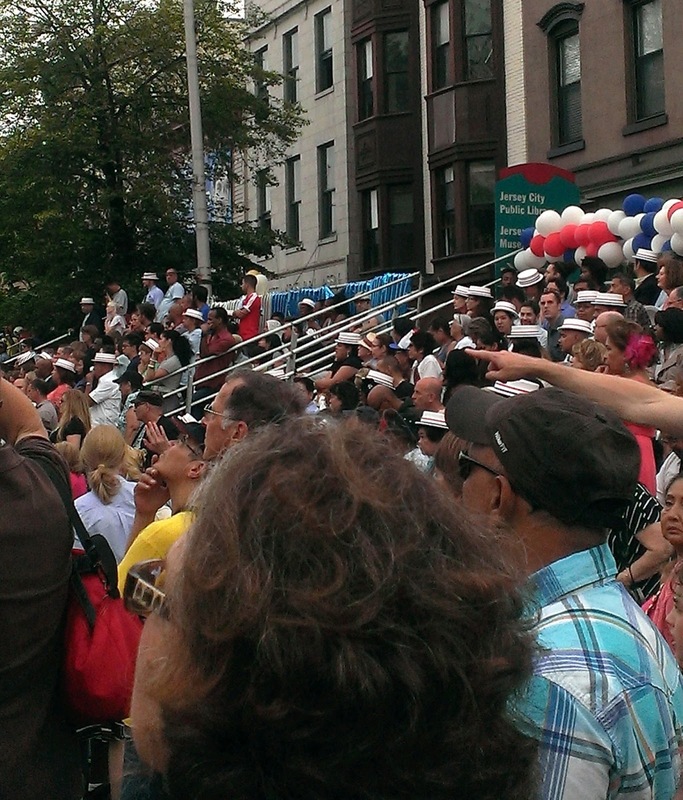 Over the next two weeks, from July 29th through August 9th, Hudson County is holding Restaurant Week. A number of restaurants throughout Hudson County, including many Jersey City restaurants, will be offering prix-fixe menus for lunch and dinner. I've been to White Star Bar a few times and always enjoyed both the atmosphere and the food, so I was curious to see how delivery service would stack up to the bar itself. White Star is small, but has a good selection of beers on tap and a menu that focuses on slightly upscale bar food - there's burgers and sandwiches, but also grilled and roasted entrees, tacos, soups, salads, etc. all with a slight twist that stands above the standard versions you might otherwise find. The first time I ordered, I got a BLAT (bacon, lettuce, avocado, and tomato) with mayonnaise on toasted whole grain pullman bread ($8) and the house salad ($6). 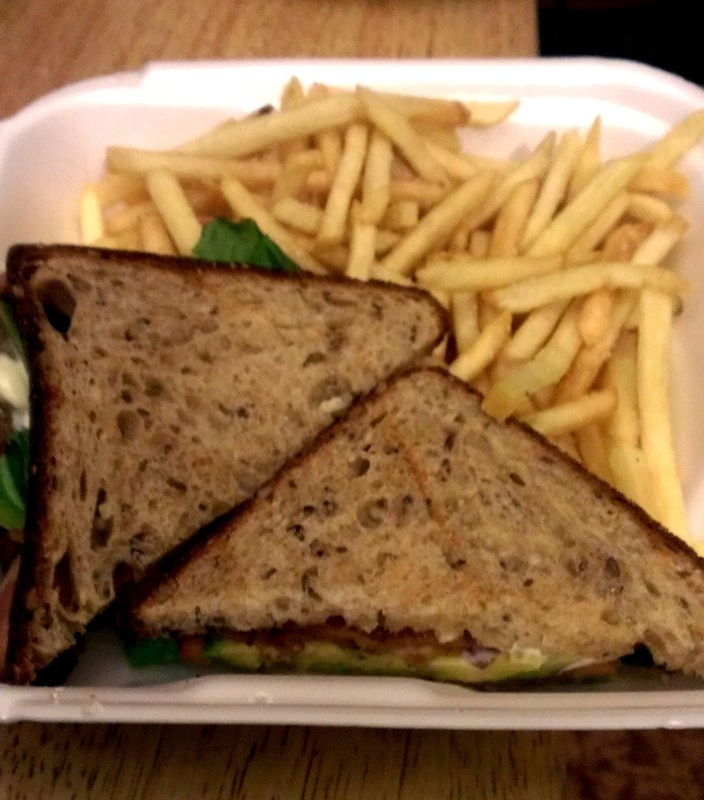 The BLAT sandwich came with a very generous side of fries which were still nice and hot by the time they got to me. They weren't super crispy but definitely not soggy which is not an easy thing to pull off with delivery fries. 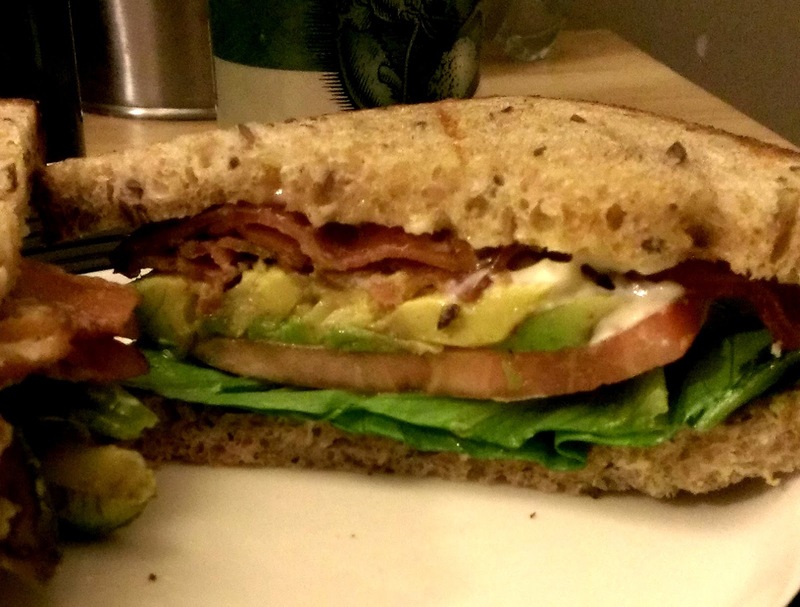 The BLAT itself was...well, somewhat disappointing. Having had the sandwich at the bar, I know how good it can be and this one just did not meet those standards. The heat from the fries must have slightly steamed the toasted bread so it became dry but kind of chewy and the tomato was far from ripe while the avocado was overripe. Relatively minor complaints, and only one delivery-related, but all together, it was enough that I left most of the sandwich alone, eating one side of the bread topped only with lettuce and bacon. The bacon itself was excellent - good quality, thickly sliced and both crispy and chewy. It was fine...but I don't think I'd order it again, at least not for delivery. At Newport Green, it's the Annual Beach Party and Food Festival with many local favorites serving up food and cocktails. 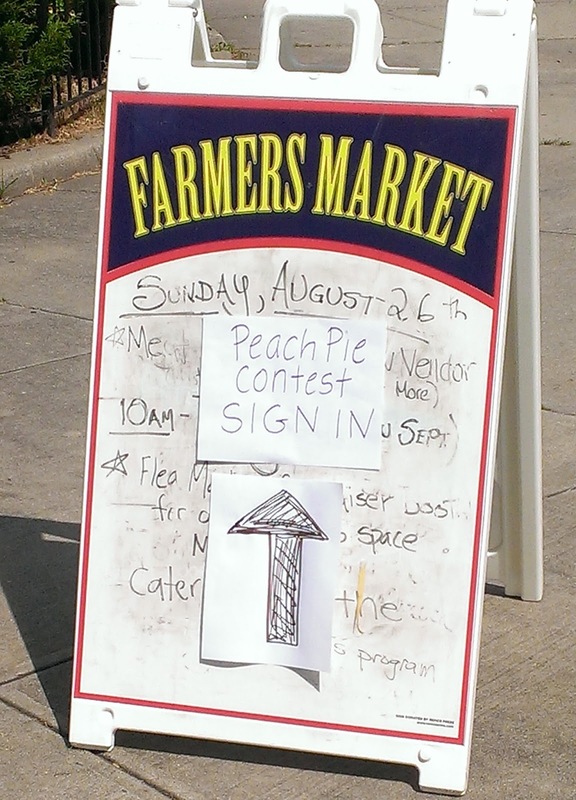 This past Sunday, on a beautiful and sunny day, the Riverview Park Farmers' Market hosted one of the state-wide Peach Pie contests. There were 13 entries in all, and Joleen Crosta of Belleville, NJ took first place with her "Vegan Peachy Peach Pie", filled with Jersey peaches and topped with an almond crumble. Sandy Martiny won second-place with her amaretto crumble topped peach pie and Lara Hartman placed third with a ginger peach pie. First, I want to apologize for the quiet around here the past week or so. There were some major technical issues that ended with me purchasing a new computer. So, hopefully, that will no longer be a problem! Secondly, I want to thank everyone who's been reading and sharing this blog. I am really grateful and excited by the response and support. I hope to keep improving and expanding as it continues and I have some plans for new features to add that I think will be helpful so please keep coming back to check it out! 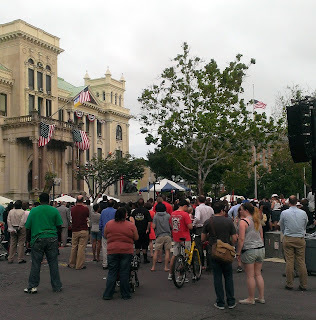 Peach Pie Competition in Jersey City! Yesterday, I received an email announcing a statewide peach pie contest! There will be competitions in south Jersey, central Jersey, and north Jersey with one of the competitions being held at our very own Riverview-FiskPark in Jersey City Heights at the weekly Riverview Farmers Market on Sunday, July 21st. Winners will go on to present their pies on Good Day in New York or Pennsylvania and two grand prize winners will be chosen. 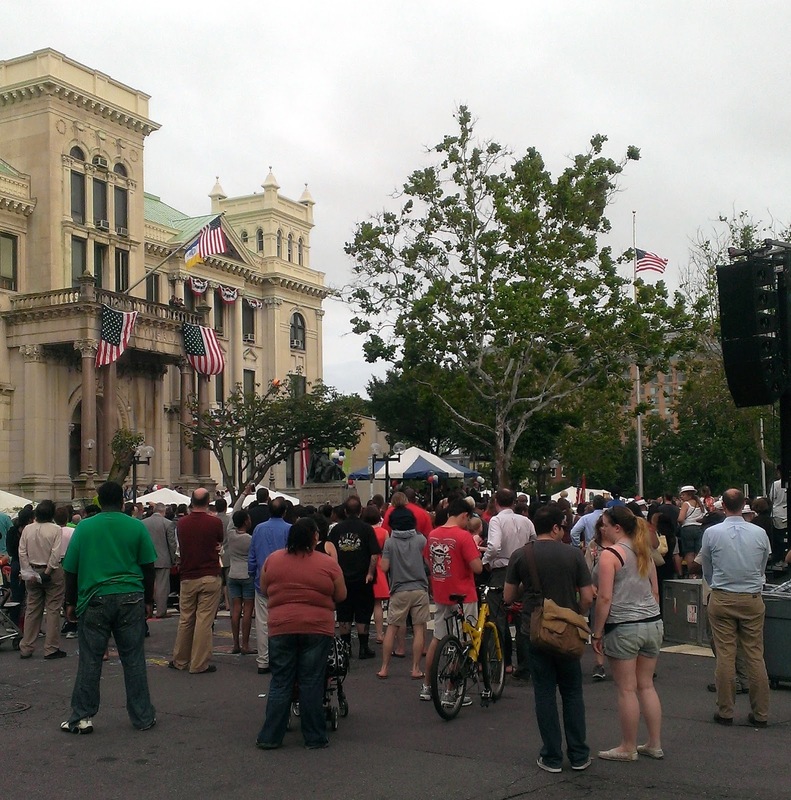 I am so excited about this – I love peaches, it’s a fun competition for the whole state to participate in, and we in Jersey City get to feature the event and enjoy it! 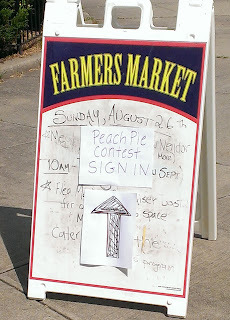 In addition to the competition and normal farmers market, there will be other fun peach-themed activities and events. 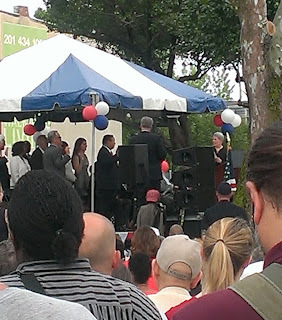 This is being sponsored by the New JerseyPeach Promotion Council and the Market is organized by Farms in the Heights. This is such a great community activity and so worth our support. Let me preface this review by saying I am not Filipino and while I’m familiar with Filipino food, I am far from an expert and so may very well have no idea what I’m talking about. Am I inspiring confidence yet? I’d walked by Fiesta Grill several times before finally deciding to stop in for lunch. It’s very cafeteria/buffet style where you just go up to the counter, point, pay and they give your food in Styrofoam bowls (which I'd love if they switched to plastic) on a plastic tray. When I went, I stared at the approximately 16-20 chafing dishes of food they had out on display for about 5 minutes which really didn’t make my choice any clearer. Approximately 75% of it was pork and while everything has a name, there’s not much by way of description. I ended up asking the (brusque but very polite) woman behind the counter what their most popular dishes were and going with that. She recommended I get the combo: rice, 2 main dishes, and a drink – all for $7! – and suggested I try the pork adobo and lechon paksiw. 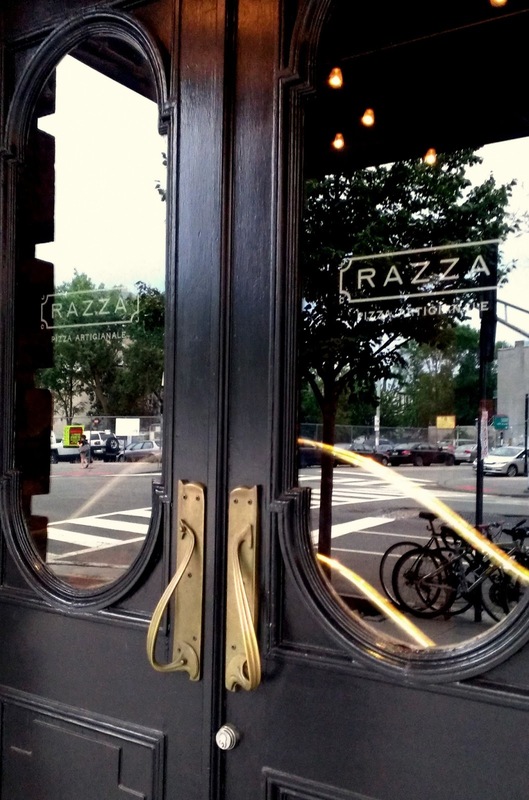 Recently, some friends and I made plans to go out to dinner and decided on Razza, a not-quite new restaurant in Jersey City that focuses on a simple menu with fresh, local ingredients. We walked in shortly before 8pm on a Friday and were greeted by a very friendly hostess who estimated a 25 minute wait. Not short, but not bad for a Friday evening. They had some space inside to wait, as well as plenty of room on the sidewalk where they had placed a trolley with chopped wood, lanterns, and a few menus for passerby to peruse which is a nice introduction to the atmosphere of the restaurant. The restaurant itself is dark with lots of wood, simply decorated with the wood-burning oven dominating the back of the space. It’s spacious without being large and is wonderfully atmospheric, both intimate and relaxed. I didn’t feel out of place when I laughed loudly and was just as comfortable having a quiet conversation. Our server was very friendly, knowledgeable, and checked in regularly without being overbearing. 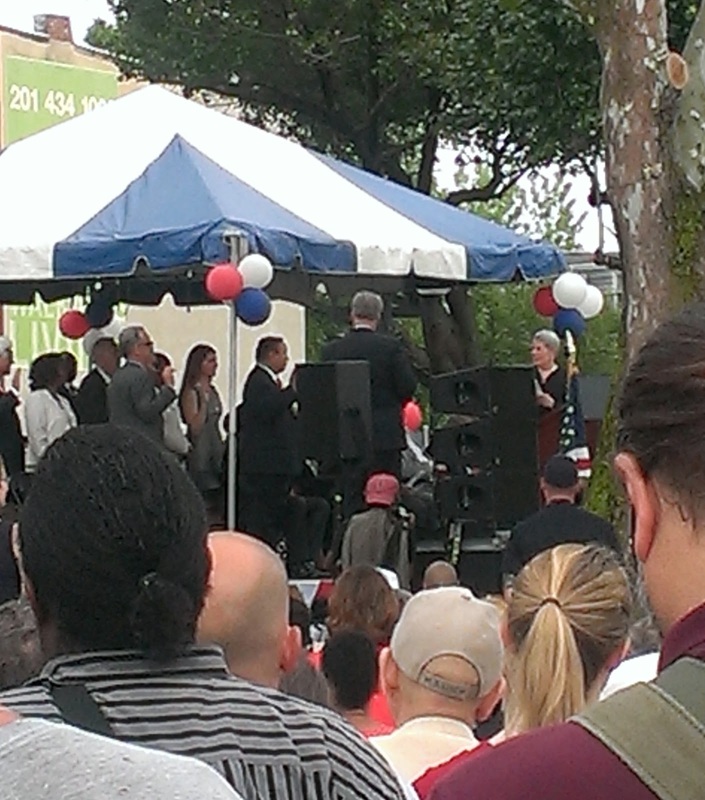 She gave recommendations easily and answered questions when we had them. When giving the list of specials for the evening (all of which sounded amazing), she gave the price for each which was much appreciated. I don’t know why more restaurants don’t do this – no one wants to deal with sticker shock at the end of the night. Last week, I met up with a couple friends to try the much talked about Grove Square Bistro. I’d been watching this place be built out for months and was genuinely curious and excited to see what it would turn into. Even when I started seeing some mixed reactions online, I held out hope that the Bistro would be a wonderful addition to the neighborhood. The first week it was open, it seemed packed even with the limited menu and what I’m sure was slightly disorganized service as the restaurant got its bearings. I'd hoped by waiting a bit until the opening kinks were worked out and the full menu was being served, I’d have a better chance of getting a feel for the place. My friends arrived before me and when I joined them, I ended up waiting at least 10 minutes before someone came by to take my drink order which is a pretty long time considering the restaurant was fairly empty. I know it’s still early days and I understand it can take a while for a staff to find its rhythm so while it wasn’t that big a deal, I was also frustrated by the fact that the glass of water the server told me he’d bring without me even asking didn’t show up until the end of our meal. Other than the timing being off, the server we had was very nice, checked in with us a few times, and did seem anxious to make sure we had everything we needed. Drinks wise, we all had something different off their cocktails menu. 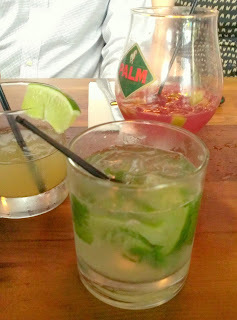 There was red sangria, a margarita, and I chose a mojito. None of these were terribly successful although the red sangria was decent. I wouldn’t go out of my way for it but nor would I turn it down. 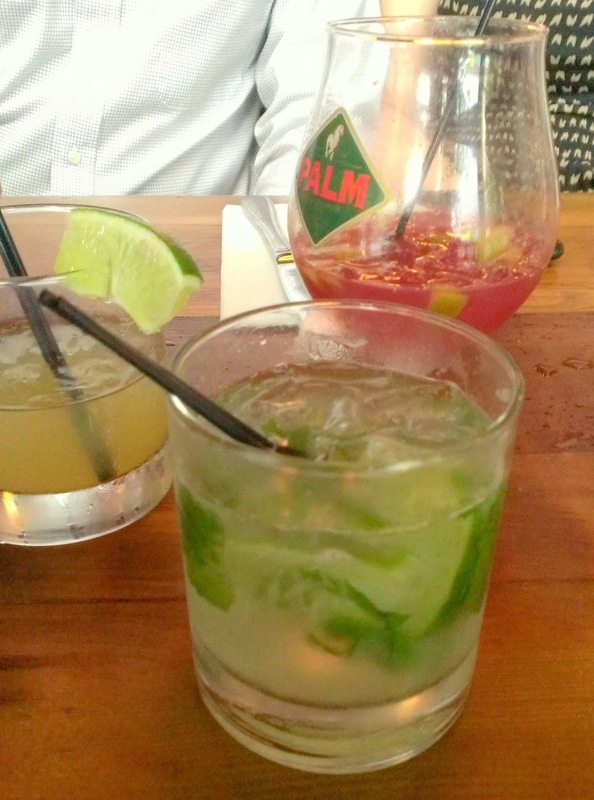 My mojito tasted like…well, like nothing. I got a bit of sugar and occasional taste of mint…but that was it. The margarita was weird. All of us agreed that was the best description as we weren't able to put our finger on exactly what was off, just that something was. I will say it didn’t taste like it was made from a mix, so that’s a plus. I couldn’t discern much alcohol in either one which is a disappointment at $8-$10 a cocktail.